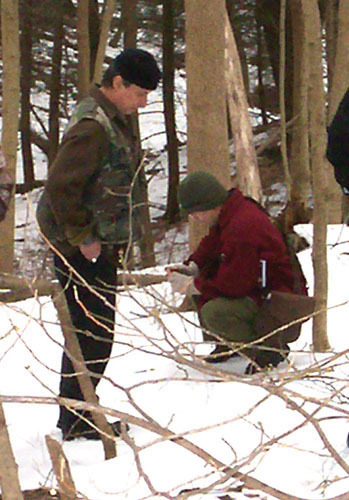 Five field observers conducted the sixth annual Esopus Bend Nature Preserve (EBNP) Winter Bird Count (WBC) on Saturday, 08 January 2011, recording 361 individuals of 34 species during a ten-hour effort that included 1.5 hours of pre-dawn “owling”. The final tally represents an average number of species (previous five-year average equals 35, with a range of 30-40 species/year), but the lowest number of individuals recorded in the six-year history of this early January bird survey. The previous low count of 451 individuals was recorded in our inaugural winter of 2006, and this year’s count was well-below our high count of 966 individuals in 2007 and the five-year average of 615 individuals. For the fourth consecutive year environmental conditions factored in the scarcity of some species, notably waterfowl, gulls, Bald Eagle, Great Blue Heron, and Belted Kingfisher on a mostly (95%) frozen Esopus Creek. An overnight storm deposited 8 inches of soft light snow over existing hard thin ice and bare ground, resulting in 100% snow cover that left many taller herbaceous seed heads exposed and attractive to some ground feeding sparrows. Temperatures ranged from an early morning low of 24° (F) to an afternoon high of 30° (F), making this one of our mildest counts over the past six years. Winds were calm throughout the count period resulting in ideal audio conditions, and reflective snow cover provided ample natural illumination for our nocturnal owl survey conducted under a solid cloud cover with no visible moonlight. Daylight skies were mostly cloudy with only very brief occasional interludes of sunlight. 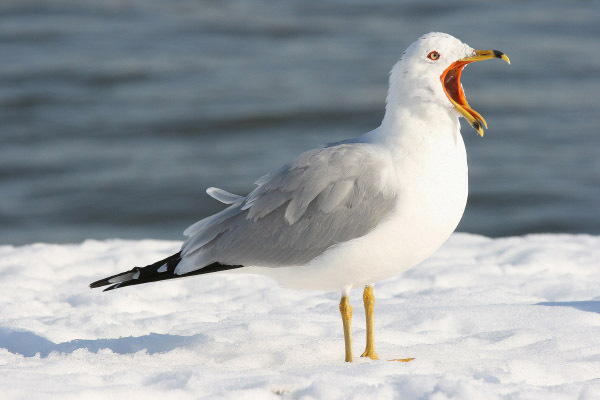 Download a Summary Report of the 2011 Survey with a comparison of the six-year history of this winter bird count. One new species (a fly-over Northern Harrier) was encountered on this year’s count that also represents a first-ever record for Esopus Bend Nature Preserve, advancing the cumulative six-year total for the Winter Bird Count to 58 species and the overall record for the Preserve to 135 bird species. Additional highlights from this year’s count include a juvenile Cooper’s Hawk observed perched in the wetlands area, an Eastern Screech-Owl heard singing at first-light, one Field Sparrow observed in the meadow (infrequently encountered in Ulster County during the winter months), and one Swamp Sparrow observed in the wetlands from the Wetlands Trail boardwalk. New high counts were recorded for Yellow-bellied Sapsucker (12), Northern Flicker (2), Pileated Woodpecker (5), and American Robin (20). Record low counts were documented for Downy Woodpecker (11), Blue Jay (15), White-breasted Nuthatch (11), Hermit Thrush (3), Song Sparrow (8), and Dark-eyed Junco (4!). Black-capped Chickadees equaled their previous low-count of 66 from last year. We did not detect any Wild Turkeys for the first time since 2006, and we missed Red-breasted Nuthatch (absent three out of the past five years), Eastern Bluebird (previously absent only once in 2009), and House Finch (previously absent only once in 2008). Winter finches (Purple Finches, siskins, redpolls, crossbills, and grosbeaks) and overwintering blackbirds were absent again this year despite the presence of a female Red-winged Blackbird that I observed in the Preserve a week earlier on New Years Day. Multiflora Rose hips and Asiatic Bittersweet crops were somewhat less abundant than past winters but still copious and widespread. Herbaceous seed heads were generally accessible above the snow pack but covered at ground level. Eastern hemlock cones appeared sparse again this year, while most oak species produced record-high acorn crops this past autumn with a good mast still remaining on the ground prior to the recent snowfall. Several spring-fed tributaries and the south stream remained open and flowing freely, one of only two small open areas of upper creek water harbored all of our recorded Mallards, and the wetland coves were entirely frozen over. All of our Canada Geese were observed in a single flock flying south-westerly, and several small flocks of unidentified ducks (most likely Mallards) were heard flying over the preserve from east to west in the direction of the upper creek just before first light, and were not included in the final tally. The Esopus Creek Conservancy’s Bird and Butterfly Walk at Esopus Bend Nature Preserve in Saugerties on June 19, 2010 experienced nice weather for a change with clear sunny skies, calm winds, and warm temperatures topping out at ~85 degrees (F). Nine participants encountered 38 species of birds and 14 species of butterflies during our four-hour walk in the meadow and along the Wetlands Trail. Some highlights include a nice look at a soaring Osprey and a side-by-side comparison of Black and Turkey Vultures gliding overhead against a clear blue sky, several nice looks at male American Redstarts, including one briefly hovering while gleaning insects from the outer leaves of a tree branch, a male Red-winged Blackbird showing off his colors in defense of his territory, vocalizing Yellow-billed Cuckoo, and a hen Wood Duck with five ducklings. One drake Wood Duck in eclipse plumage flushed from the beaver impoundment, where we also observed numerous dragonflies, including Common Whitetails, Widow Skimmers, Twelve-Spotted Skimmers, Spangled Skimmers, Black Saddlebags, and Eastern Pondhawks, in addition to a number that went unidentified. One Snapping Turtle surfaced very briefly in the impoundment. Numerous “witches” (small dark skipper butterflies of three very similar looking species) were actively bouncing their way through low dense vegetation, rarely settling for a definitive look, but occasionally providing us a confirming view of at least one or two individuals of all three species (Northern Broken-Dash, Little Glassywing, and Dun Skipper). 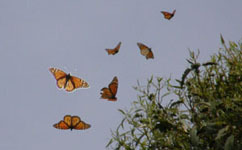 A fast circle and fly-by butterfly may have been one of the Emperors, but we never obtained enough details to eliminate Anglewings as a second possibility. Nice looks at a fresh Northern Pearly-eye and several Appalachian Browns in various stages of wear is an Esopus Bend specialty we have come to expect at this time of the year. Common Milkweed is just starting to flower and the very popular Buttonbush is still a couple of weeks from bloom. The small vernal pool along the Wetlands Trail was totally devoid of water and amphibian life, providing an opportunity to talk about intermittent woodland pool ecology and life cycles. We noted the stark difference to the flooded breeding pools teaming with activity we witnessed just a few weeks earlier in the season. As with a number of the bird species we observed today with fledged young, the annual breeding cycle for some of the species inhabiting the preserve is already coming to an end as we near the summer solstice. If you are looking for a place to hike and enjoy some quiet time exploring a natural environment, then consider taking advantage of the many guided nature walks offered throughout the spring, summer, fall and winter at Esopus Bend Nature Preserve. They are free, open to the public and listed on our calendar. As you enter the Esopus Bend Nature Preserve during the winter months, you may be greeted with a blanket of snow. Like a magic carpet that brings a hidden manuscript into view, the snow reveals a story written on the forest floor. The letters and words that tell the story are animal tracks that record the daily comings and goings of those who call the preserve their home. 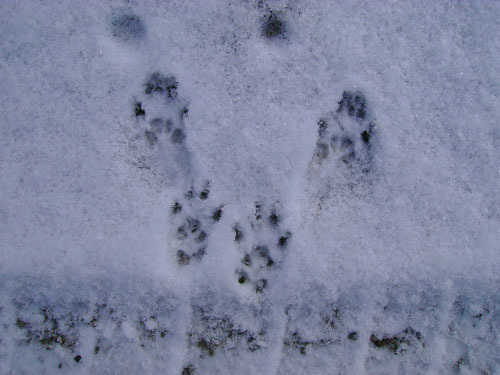 Largely invisible during the other seasons, during the winter these tracks offer a fascinating insight into the lives of these forest beings. When you take the time to follow and study the tracks you begin to realize that the things that drive the forest inhabitants are not so much different from the things that drive us. When we are hungry we go to the kitchen to find food; they also go to areas where food is available. When it is time to retire we go to the security of our bedrooms and lie down; when they retire they go to a place where they feel safe and lie down. Birth, death, companionship, solitude, warmth, coolness, shelter, protection, the same basics needs exist for us all. Surprisingly, if you look deeper into the tracks, and break through the barriers of logic and science, you begin to get the notion that the same life force that runs through you, also runs through the track makers. The memory of this kinship has been lying deep in your consciousness like a smoldering ember. You begin to understand that when the white tailed deer browses a striped maple bud, that it is your lips that touch the branch, and when a red fox pounces on a white footed mouse, you hold the mouse in your jaws, and it is you also held in the jaws. You begin to recall a timeless bond. So, as you enter the Esopus Bend Nature Preserve after a snowfall, don’t be surprised if you get the feeling that you are returning from a long trip down the evolutionary highway, to a familiar place, a place that harkens back to the childhood of your existence. The fifth annual Esopus Bend Nature Preserve Winter Bird Count (WBC) was conducted on Saturday, 09 January, recording 502 individuals of 35 species during a twelve-hour effort that included two hours of pre-dawn “owling” (5:00 a.m.- 5:00 p.m.). In comparison to previous counts, the 2010 WBC recorded an average number of species (four-year average equals 35) and an intermediate number of individuals, with two previous counts detecting more birds, and two counts producing fewer individuals. For the third consecutive year, environmental conditions factored in the scarcity of some species, notably waterfowl, gulls, Bald Eagle, Great Blue Heron, and Belted Kingfisher on a nearly completely (99%) frozen Esopus Creek. Temperatures ranged from an early morning low of 12° (F) to an afternoon high of 22° (F). Winds were calm throughout the count day, with only an occasional slight ENE breeze. Fair night skies, a waning crescent moon, and reflective snow cover provided ample natural illumination for our two-hour nocturnal owl survey, followed by day-long clear skies and brilliant sunshine. Snow cover was 100%, averaging 1-3” of soft powder over hard ice in exposed areas, encasing most ground feeding resources. Two new species were recorded for the Winter Bird Count, and also represent first-time records for Esopus Bend Nature Preserve (EBNP), advancing the cumulative five-year total for the count to 57 species and the historical composite for EBNP to 134 bird species. Three Black Vultures were observed circling low over the large sandbar due north of the meadow, providing a stunning view against a deep blue sky of this traditionally southern species that only a decade ago was a rare sight in New York State at this time of the year; and one Cooper’s Hawk was observed flushing neighboring feeder birds at the Edgewood entrance before perching for several minutes high up in a deciduous tree bordering the Meadow Road access. Three Field Sparrows represented a new high count for this half-hardy species infrequently encountered any where in Ulster County during the winter months; and new high counts were recorded for Golden-crowned Kinglet (32, nearly three times the previous high count of 12 in 2009 and 2006), and American Goldfinch (15, eclipsing 13 in 2009 and 2007). Several flocks of Cedar Waxwings were consistently present during our two-hour survey of the meadow and wetlands, foraging on abundant Asiatic Bittersweet and actively moving around, creating a challenge to obtaining an accurate count while avoiding duplication, and resulting in a conservative estimate of 58 individuals. We did not detect any owls during the pre-dawn survey, and record low counts were recorded for Downy Woodpecker (18), Black-capped Chickadee (66), Carolina Wren (7), Hermit Thrush (5), American Tree Sparrow (2), and Song Sparrow (10). We also failed to detect any Northern Flickers, Red-breasted Nuthatch, Winter Wren, or Swamp Sparrow; and (not unexpectedly) overwintering blackbirds, starlings, and winter finches (siskins, redpolls, crossbills, and grosbeaks) were completely absent this year with the exception of one male Purple Finch. Multiflora Rose hips and Asiatic Bittersweet crops were good to abundant and widespread. Herbaceous seed heads were generally accessible above the snow pack but encrusted at ground level. Eastern hemlock cones appeared sparse again this year, as did most mast crops. Several spring-fed tributaries and the south stream remained open and flowing freely, and one tiny patch of open creek water at the historic ferry crossing harbored our only waterfowl for the count — a drake and hen Mallard. Thanks go out this year to Alan Beebe and Nancy Ebel for their effort in conducting this count, and Joe Hernandez and his young grandson Gavin Metcalf for joining us for the first hour. Information collected from this annual January survey of the 160-acre nature preserve provides a basis for monitoring future winter bird population dynamics, and guidance for current and future land management and stewardship decisions. Next year’s WBC will be conducted on the traditional second Saturday of the month, January 08, 2011. The Catskill Center’s Education Program was built on partnerships. We certainly consider each of the 20-plus schools we work with our partners. Then there are those partners that work alongside our program staff to enhance our programs throughout the region, like the Catskill Forest Association, Trout Unlimited, and the NYCDEP. And then there are those partners that both fund and assist in program development of some of the education work that we do, like the Watershed Agricultural Council, Otsego-Northern Catskills BOCES, the Catskill Watershed Corporation, and the Land Trust Alliance. For the last year and a half, armed with grant in from the Land Trust Alliance, the Esopus Creek Conservancy (ECC) has spearheaded a terrific three-pronged partnership between the ECC, The Catskill Center, and the Saugerties Central School District. All three of the partners bring something special to the table. The ECC oversees the 161-acre Esopus Bend Nature Preserve (EBNP) that borders the Esopus Creek in Saugerties. The Catskill Center brings our experience with place-based education, namely “The Catskills: A Sense of Place” curriculum. And of course the Saugerties school district provides the educational interest and the audience (both 3rd graders and high school students). 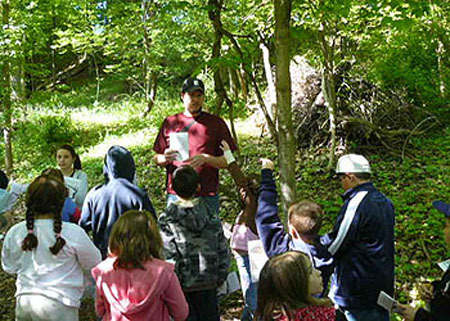 The Catskill Center has facilitated numerous workshops for over 20 third-grade and high school teachers – helping them plan for their now-required fall and spring fieldtrips to the nearby Esopus Bend Nature Preserve. Additionally, Catskill Center staff has provided ecological and hands-on programming at the EBNP for these students for the last two school years. In May, every third grader and third-grade teacher from the four elementary schools in the Saugerties school district (Cahill, Morse, Mt. Marion, and Riccardi) visited the EBNP as part of their curriculum, and Catskill Center staff led each group on a session about aquatic macroinvertebrates in the Esopus Creek and an ‘ecological scavenger hunt’ by the students. During most of the fieldtrips, students not only spend four hours outside at the EBNP, but they also eat their lunch there, and learn from their classroom teachers, ECC Board members and volunteers, and Catskill Center staff in a fun, hands-on, and incredibly effective way. Because of this unique partnership, these students are learning about their local surroundings and are beginning to realize the ecological and educational value of preserving areas of open space (like the EBNP) in their local community. As they mature, they too will come to realize that these natural areas, located within built-up environments, not only provide aesthetic benefits to community residents, but also provide wildlife habitat, water quality protection, recreational opportunities, and higher property values, among others. The next time you are in the Saugerties area, be sure to stop by the Esopus Bend Nature Preserve and maybe you’ll catch one of its great public events, or just maybe you’ll be lucky enough to see 50 students researching, writing, drawing, measuring, or just simply observing some aspect of Mother Nature that can only, TRULY, be learned in the outdoors.